Synopsis: Connie is not a child who likes books. So she's not too pleased when she's sent to stay with her eccentric author aunt. But then Connie meets Ruby –– a book-fairy –– in the dusty old library. Ruby is in trouble: she has broken fairy-law by trying to take something –– a piece of jewellery –– back to fairyland through the 'gateway' of a fairy-dust-sprinkled book. And now the jewellery has disappeared and Ruby can't get back home! 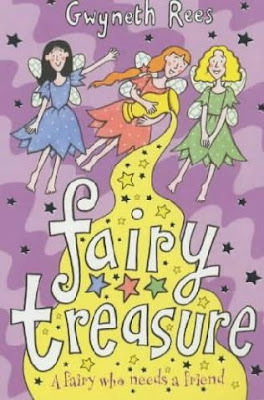 Can Connie help Ruby find the missing jewellery before the doorway to fairyland is closed forever? Connie has never believed in fairies, so she’s amazed when ruby, a tiny fairy – girl, suddenly appears in the library of the old house where Connie is staying. Ruby says that she is a book fairy – but that she is in terrible trouble. She has been banished from fairyland until she finds a ruby ring, which she has lost. Can Connie help ruby find the missing ring – before the doorway to fairyland closed forever? Review: this book is about fairies and it is a really good book and it is easy to get into and it is 236 pages along but it is a children books but i had this book for years but sometimes like reading it again from time to time and l know it is a children book but oh well it is really enjoyable and l love it.